Phinehas is using Smore newsletters to spread the word online. 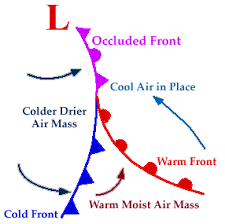 A warm front is formed when a warm air mass and a cold air mass meet and the warm air pushes the cold air down as it goes on top. Starts rain and sometimes fog. It make cirrus and cirrostratus clouds. After the warm front passes the skies should be clear and it should be warm.